The IAM Local 1529 Negotiating Committee recently completed the Negotiation Preparation Program at the Winpisinger Center in Hollywood, MD. 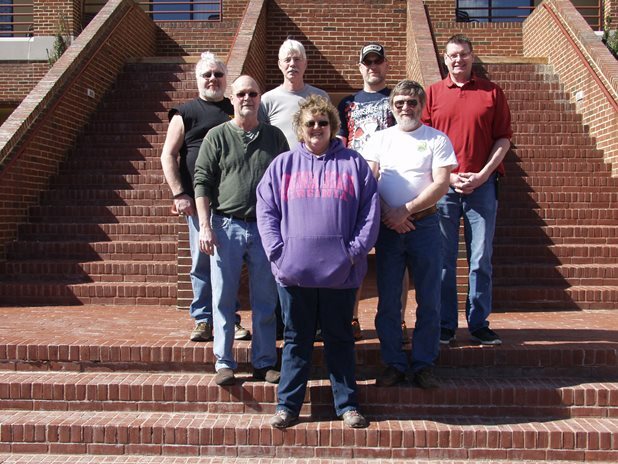 First row from left: Committee member Toni Shelton. Second row: Local 1529 Vice President Randall Birdsall and Committee member Chris Cornish. Third Row: Committee members Richard Rock, Jr., Larry Clark, Ricky Tweedie and District 15 Business Representative Bruce Hodges. The negotiating committee for IAM Local 1529, along with District 15 staff, participated in the Negotiation Preparation for Bargaining Committees program at the William W. Winpisinger Center in Hollywood, MD. The committee represents employees who manufacture electrical connectors at Amphenol in Sidney, NY. The week-long Negotiation Preparation class included training in drafting contract language, presenting proposals, analyzing the company’s strengths and weakness, communications and identifying a broad array of potential tactics. Recognizing that this promises to be a difficult round of negotiations, the committee strategized to learn from bargaining history, map a new direction for relations with the company, insert stronger contract language, improve working conditions and build solidarity in the bargaining unit. The current contract with Amphenol expires October 21, 2016.